Development and use of the Nobles Emigrant Trail, an important 19th century pioneer route that passed through what is now Susanville, will be the topic of a Lassen Land and Trails Trust "Discover Lassen" presentation this Wednesday, April 17th, at 7:00p.m., at the historic Susanville Railroad Depot, 601 Richmond Rd. in Susanville. Speakers will include Ken Johnson, author of The Nobles Emigrant Trail, and Jake Martin, an archaeologist with the Bureau of Land Management's Eagle Lake Field Office in Susanville. 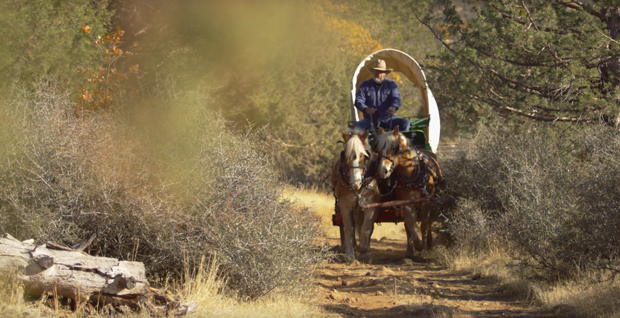 The presentation will include a screening of a short film, The Historic Nobles Emigrant Trail, produced by the Advanced Laboratory of Visual Anthropology at California State University, Chico, in partnership with the BLM and Susanville Indian Rancheria. Explorer William Nobles pioneered the trail in 1851 and it came into wide use a year later. It gained popularity as a shorter and more direct route to California's Sacramento Valley. Thousands of emigrants used the route. Remnants of the trail are still visible. Johnson will present a slide show and explain that the trail from the Nevada's Black Rock Desert to Shasta City in California is one of the easiest and most interesting emigrant trails that can be paralleled in vehicles. 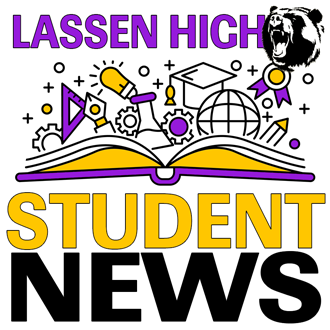 Lassen High School is now accepting applications for the Student Trustee position on the Lassen Union High School District Board of Trustees. Applications can be picked up at the ASB counter in the Library and are due back by April 30th. Responsibilities include attending all board meetings, reporting to the Student Senate and representing all students to the LUHS Board. If any LHS student is interested in applying for this office please pick up an application, or if you have questions please contact Carrie Satica in room 313. If you are interested in stuffing Easter Eggs with candy for the annual Community Easter Egg hunt, please see Mrs. Bennett in 115. This volunteer events takes place this Thursday, April 18th, at 4:30 in Jensen Hall at the fairgrounds. The performing arts club is sponsoring two cool after school events. On Monday, April 22nd, we will play with stage makeup and on Monday, April 29th work on set building. Both classes are 3:30-5:00 in the drama room. Girls' Basketball Spring Basketball Open Gym dates: April 22nd, 24th, 29th, and May 1st in the Big Gym from 6:30 - 8:00p.m. All girls interested in playing basketball for LHS should attend. Boys' Basketball will have open gyms starting April 23rd on Tuesday and Thursday nights from 6 to 7.30. Make plans to join us at the Thursday, April 18, 2019 Chamber Mixer as we celebrate High Sierra Collision & Towing's 20th year in business. They will be hosting the April Chamber Mixer in celebration, from 5:30 to 7:30pm, at 472-635 Johnstonville Rd., Susanville. Food, no-host bar and great prizes will be given away. You do not need to be a Chamber member to attend everyone is welcomed to stop by to mingle with friends and business associates and join in the celebration. The 2019 Spring Show that will be held on Saturday, April 27th, from 10am to 3pm, and will be held at the Lassen County Fairgrounds. If you are a business that falls in home, garden, recreation, or you are a wedding vendor we hope you will sign-up to participate. The one day show is a great way to advertise your business or service to over 1,500 people who, on average, attend the show each year. There are still spaces available for vendors to sign up to participate. Food and beverages will be available and public entry into the show is free. Stop by the Chamber office to pick up an application or call 257-4323 to have an application forwarded to you. A vendor application can also be downloaded from the Chamber website www.lassencountychamber.org. Give blood during Pet Lovers Month and be entered in a weekly drawing for $250 pet store gift card. Plus, donors can give their Hero Reward points to the Lassen Humane Society as a monetary gift. Every three seconds, someone in the United States needs blood and more donors are needed daily for trauma, surgery and cancer patients in our community. The blood you donate today can help save up to 2 lives. Since blood can't be manufactured, we rely completely on volunteer blood donors. The blood drive will be held at the Church of Jesus Christ of Latter-day Saints at 905 Richmond Road on Tuesday, April 16th, from 12:00p.m. 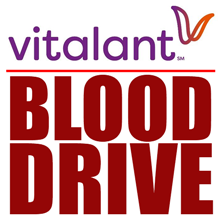 to 6:00 p.m. and on Wednesday, April 17th, from 8:30 a.m. until 1:30 p.m.
To schedule your life-saving appointment, call 775.329.6451 or log on to www.bloodhero.com click donate blood use sponsor code SUSANVILLE. Walk-ins are welcome just bring your I.D. Bring your fast pass and save lives and time with our online health history. The health history must be completed the same day as the donation, it cannot be completed a day or two ahead of time. Click here to find out more about our advertising options. Joining forces, American Legion men from Susanville and Reno laid the cornerstone of the Lassen Legion Memorial at Susanville yesterday, more than forty members of Darrell Dunkle post of Reno, driving up to the Lassen town. The principal speech of the day was made by Judge Thomas Moran of Reno. He dwelt on the friendliness between the northern part of California and Nevada and paid a touching tribute to the late John E. Raker, California congressman. H. G. Mathewson, representing the department commander of California and E. F. Koken, Lassen county road supervisor, also spoke, George Winchester, commander of Thomas Tucker post of Susanville, presided and the cornerstone ceremonies were opened with a prayer by H. C Lind, Thomas Tucker post adjutant. The ceremonies were simple but were taken part in by all civic and fraternal orders of Susanville and legion men from Westwood attended. 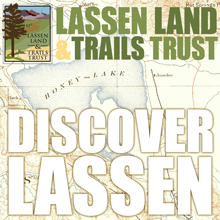 If you are a fan of our daily history stories you should join the Lassen Historical Society! It's a fun way to be a part of our county's rich history. When you sign up you'll receive regular Historical Society newsletters with interesting stories and information. Membership is open to anyone with an interest in area history. Through your membership you help preserve local history. to go see a movie! What happened when the Easter Bunny misbehaved at school? Congratulations to Megan Reed, winner of this week's Pizza Factory giveaway! 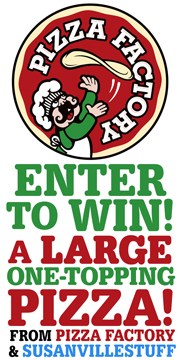 You too could win a large one-topping pizza from the Susanville or Janesville Pizza Factory locations just by entering our weekly giveaway! Just click here and follow the link to our handy entry form. You can enter once per day from each email address. We'll announce our weekly winner right here next Monday morning. Lassen Ale Works at the Pioneer Saloon Industry Night, every Monday from 4:00 - 8:00 p.m. Lassen County's only industry night for restaurant, bar, food service and hospitality professionals. Relax and get waited on for a change. Bring your business ID or paycheck stub for specials on appetizers and beer. 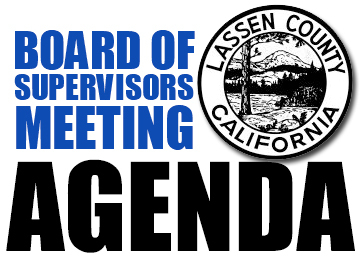 Lassen County Board of Supervisors meets the 2nd, 3rd and 4th Tuesday of each month. From 9:00 - 10:00 a.m. at 707 Nevada Street, Susanville. Lassen Ale Works at the Pioneer Saloon Trivia Tuesday will be every Tuesday night from 6:00 - 7:00 p.m. $5 per person to enter. Teams of 1-4. Winners take home cash prizes. Soroptimist International of Susanville is a women's community service organization. Soroptimist sponsors many awards and scholarships in our community. Join them every Tuesday at noon in the Willow Room the Diamond Mt Casino. For more information please contact Sharon at (714) 393-5487. $10.00 for lunch. 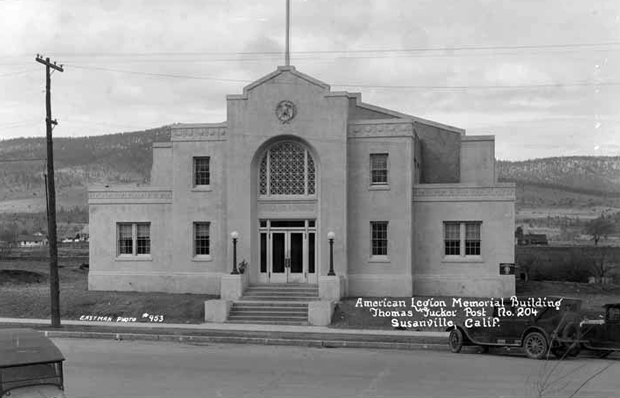 Susanville City Council Meeting 6:00 - 8:00p.m., at City Chambers 66 N. Lassen Street. Susanville City Council Meeting 1st and 3rd Wednesday of each month. 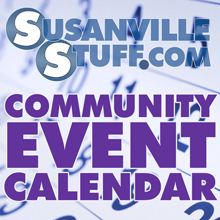 Susanville Weight Watchers meet Wednesdays from 12:00 - 1:00 and 5:30 - 6:30 at the Susanville Mall Community Room, 805 Main Street, Susanville. For more information, please contact Theresa 530-310-5896. Lassen Aurora Network Veteran's Support Group Wednesdays 6:00 - 8:00 pm at 811 Cottage St, Susanville. Our Mission is to provide a judgment-free environment where Veterans from all era's and services can meet and discuss issues without outside influences. Lassen County Chamber Mixer - hosted by High Sierra Collision & Towing 5:30 pm - 7:30 pm High Sierra Collision & Towing 472-635 Johnstonville Rd. Susanville CA 96130. Celebrating 20th Year in Business Anniversary. 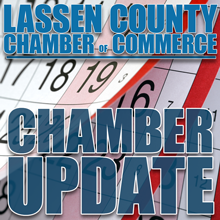 For more information, please call the Lassen County Chamber of Commerce 530-257-4323. Masonic Lodge #149 host their 3rd Saturday Breakfast from 8:00 - 11:00 am. 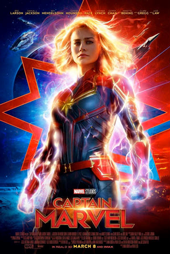 The cost is $6.00, and it's held at the Susanville Masonic Hall on Lassen Street (Across from the Post Office) the 3rd Saturday of each month. Proceeds go to benefit the School & Scholarship Fund. The annual Susanville Community Easter Egg Hunt will be held Saturday, April 20th, at the Lassen County Fairgrounds. All Susanville kids are welcome to come hunt for Easter eggs. The gates open at 8:30 and groups start at 9:00 with a different age group starting every 10 minutes. The Easter Bunny will be at the fairgrounds so bring your cameras for a photo opportunity. Milford 4H and the Milford Community Association will hold their annual Easter Egg Hunt on Saturday, April 20th, at 10:00a.m. Kids from three different age groups; 5 and under; six to nine and 10 to 12, will have a chance to find a golden egg and win a big prize. The Easter Bunny will make an appearance so remember to bring a camera to take pictures. Milford 4H will be serving free breakfast burritos. The event will be held at the Milford Community Center at 450-075 Laufman Grade Road. 30th Annual Fishing Derby. Kids ages 2 to 15 are invited to come enjoy a beautiful morning of fishing, both in Memorial Park and along the river, at the Lassen Sportsmen's Club sponsored event. The derby is co-sponsored by the City of Susanville, the County of Lassen and the SIR Tribal Indian Council. The busy morning starts at 5:00 with registration and check-in at Memorial Park. Registration and check-in end at 9:00a.m. Derby prizes will be awarded after the 3:00p.m. close of the event, and winners don't need to be present to win. Kids shooting for the 'largest fish' prizes should be off the river by 2:45p.m. and must be in line for weigh-in by 3:00p.m to qualify. Door prizes will be drawn at the same time and for these winners must be present. Diamond Mountain Speedway - First Race For more information and more race dates, please visit Diamond Mountain Speedway on Facebook.